The T50 Summit of World Construction Machinery Industry was held in Beijing on September 19. Jointly organized by China Construction Machinery Industry Association, the American Equipment Manufacturers Association (AEM) and Korea Construction Machinery Manufacturers Association, T50 is one of the most influential summits in the industry. 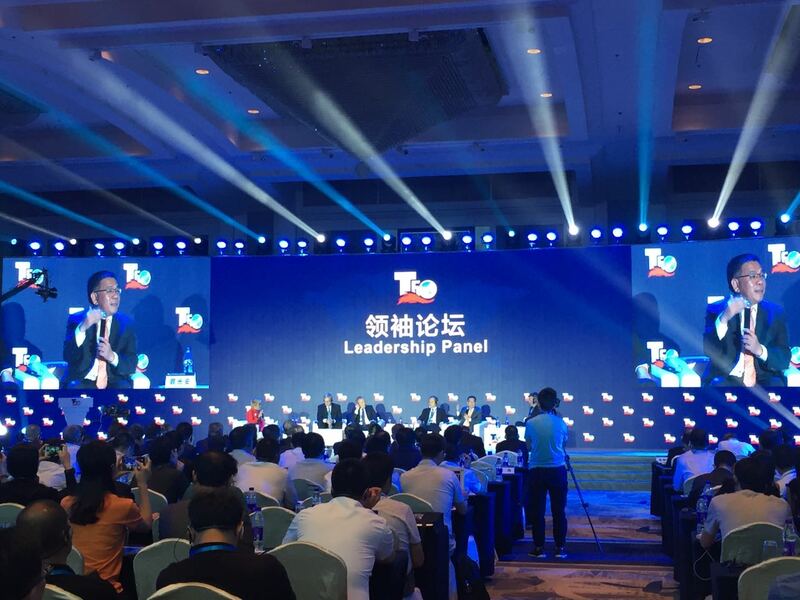 As one of the world’s Top 50 construction machinery manufacturers, LiuGong attended the summit and Chairman Zeng Guang’an was invited to give a keynote speech. President Huang Haibo and Vice President Huang Min participated in Wheel Loader Panel and Excavator Panel respectively. Since the first half of 2017, the construction machinery market has embraced a strong rebound, and the core product of excavator has increased by 100% in China. Some reasons for the increase are as follows: First is after the implementation of China’s 13th Five-Year Plan, a large quantity of new projects and new investments were kicked off. Secondly, the rising price of raw materials has encouraged more operating hours in mining including metals, nonferrous and ferrous metals, coal and sand stone, bringing new demands for the machines. Third, the machines produced in the peak period of 2009 to 2011 have gradually withdrawn from the market, which requires new machines to replace them. This new demand should last 2-3 years, covering 2018, 2019, and even 2020. Fourthly, China's economy has reached a new balance after its adjustment over the past 4 to 5 years. Last but not least, the urbanization, decline of the workforce and the raise of labor costs are contributing to the growth of the CE industry, all will remain strong factors in next ten or twenty years. Additionally, the Chinese government has strong willingness to protect the environment and invest in agriculture, forestry and natural facilities, both would boost the development of new construction machinery products. Chairman Zeng Guang’an also pointed out that some factors would disappear in 2018, but customers’ pursuit of efficiency and the restructure of the labor force would continuously push the industry forward. Chinese economy is expected to maintain a steady rise in the next few years and in the meantime, the global economy is recovering, including Europe, North America, and more obvious in emerging markets like Brazil, India and Russia. So, we may predicate that the Chinese CE industry will maintain a moderate balance in 2018 with a 10% plus-minus change or so. In the past 5 years, China’s construction machinery industry has recovered from a long-term recession which also brought tremendous changes to the industry. The market growth this year was good news but we also need to think what this will bring to our future development. Firstly, the customers will be more concentrated. In the past, clients were individuals, but in the past 5 years, more and more large rental companies and business groups have become the main buyers to purchase comprehensive machines to fulfill various application needs. These buyers have strict budgets and moreover, intend to control the total cost throughout machines’ full life cycle, which has required higher requirements in performance, quality, operating rate and even the residual values for second hand machines. Second, due to the changes of Chinese economic structure, population, and users’ habits, compact equipment with small horsepower engines will replace the human labor in the future, which means compact equipment like mini-excavators and small-sized road equipment will have a bigger impact. In addition, along with the development of China's economy and cities, we will have new marketing demands. Some of them, ariel-working platform for instance, may have mature development in developed markets like Europe and America. But the Chinese market has its own demands of innovative products to meet with customers’ application requirements and special working conditions. Last year, we launched the revolutionary vertical lift wheel loader. This is a truly new product not like any of the traditional wheel loaders in the market. With this articulating frame loader, customers can move more tons per hour for lower initial investment, and lower owning and operating costs than would be required with conventional radial arm technology. Where there is development, there is construction machinery demand; where there is the sustainable progress of CE industry, there is a market for the sustainable development of engineering technology. Chinese CE industry can maintain its competitiveness in the world through continued innovative thinking.